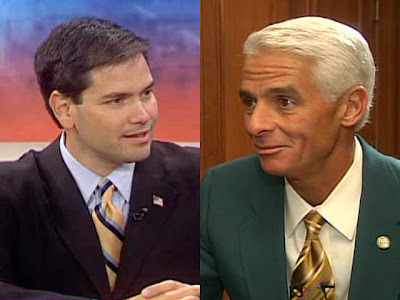 On Sunday March 28th, Marco Rubio and Charlie Crist will sit side-by-side on the set of the popular Sunday talk show Fox News Sunday with Chris Wallace. There are no rules and the event may consume the entire hour of the program. Recent polls show Rubio with a double digit lead over sitting Governor Charlie Crist in his bid to become Florida's next US senator. That is the complete opposite from the way the polls looked as early as last summer. Format is Sunday Show-talk style. The debate will take place in FOX's DC Bureau, where the FOX News Sunday set is located. There will be no audience, and it is expected to last most if not all of the show (with some commercial breaks). It will be the first time that the two candidates have met head-to-head to exchange their opinions about the future of the state and their role in Washington. It is MUST SEE TV if you are in to politics. It should be a "spicy" debate with each candidate attempting to further his views about the state of the nation and the state of Florida. Nice post, Nelsa. Hope you are doing well! This should be a great debate!